Tonight was the conjunction of Venus and Jupiter. Visibility was poor here, but my good friend Steve King got a great pic and added a brilliant verse from this week’s Torah portion. Pure genius!!! 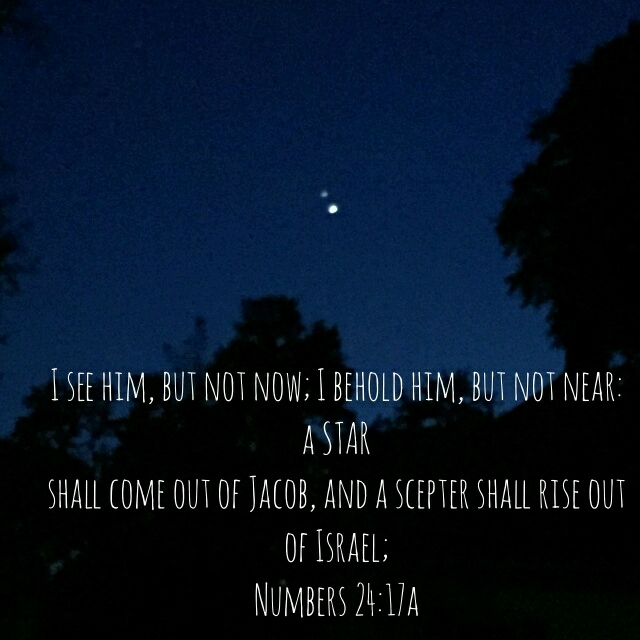 This entry was posted in Visual Scripture and tagged conjunction, Jupiter, Messiah, photography, prophecy, Venus. Bookmark the permalink. thanks for posting the pic! we were covered up from Canadian wildfire smoke for over two days! smoke has cleared today, but it’s cloudy. Yeah. So glad we watched it Sunday and Monday evenings. We have desperately needed rain and got a little last night with a BIG storm moving in right now. . may see the two parting ways tomorrow, but, like you, thankful for the pic!